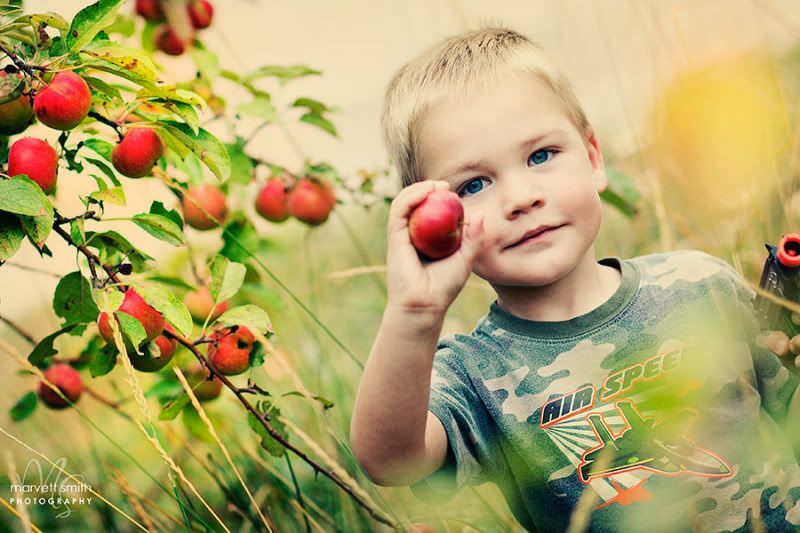 The theme at I Heart Faces this week is "In The Orchard". For this challenge I am reminiscing. I am thinking back to The Apple Tree Journey I took with my boy, and how much fun we had together. I am remembering the strong old apple tree that has been proudly standing near my parents home since I was my little boy's age, and I am remembering my own journeys there with my dad. I am remembering how much happiness this apple tree has brought to my family, and I am remembering how much we smiled on this fall day. I am remembering that I have grown so much since this picture was taken, and so has my boy. We have done it together. This may just be one apple tree, but to us it has been as plentiful as an orchard. Love the warmth and vintage feel to this. Also love the contrast of the precious apple in one hand and the toy gun in the other. Hahaha. Such a boy. Aaaahh, isn't that the truth! The simple things in life make for the best moments & memories. Lovely photo of your handsome boy. Good luck ;)! Great photo and colors! He's a sweet looking boy. AH-MAZING! Love it!! What a sweet sweet boy. so cute! love the processing! The colors are just wonderful on this! Great job. Marvett--I sure love your little Doop. One day I will actually meet him. P.S. I've missed you and your beautiful photos.